After a month-long poll, the public has chosen to aim the Hubble Space Telescope at Arp 274, a pair of merging spiral galaxies. The pollsare closed and the votes are tallied: The public has decided to aim the Hubble Space Telescopeat a pair of merging galaxies and take a snapshot of the cosmic smashup. 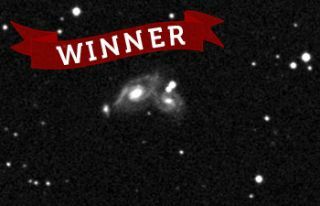 Out of the140,000 votes in an online NASA contest, a pair of interacting galaxies knowncollectively as Arp 274 beat five other astronomical contenders as the people?schoice for the iconic observatory?s next target. Voting ending on March 1. Arp 274 weighedin with a hefty 67,021 votes to top the polls of NASA?s ?Hubble,You Decide? contest, which allowed the public to pick one of six astronomicalcandidates as part of the ongoing InternationalYear of Astronomy. Hubble will turn its camera eye on Arp 274 between April2 and April 5 during the International Year of Astronomy?s ?100Hours of Astronomy? to generate a high-resolution, full-color image that willbe released to its eager public. The twospiral galaxies that make up Arp 274 are being drawn together by gravity. Whiletheir spiral shapes are intact for the most part, there is some evidence of gravitationaldistortions within them as they gradually merge together. Astronomersexpect to see elegant lanes of interstellar dust, stars and bright blueclusters of baby stars in Hubble?s new view of Arp 274. NASAlaunched the Hubble Space Telescope in April 1990. Since then, the observatoryhas spent nearly 19 years scanning the depths of the universe and returningstunning views to scientists and the public on Earth. Four NASA spaceshuttle crews have visited the space telescope to make repairs and upgradesduring its orbital life. The fifthand last overhaul for Hubble is currently slated to launch on May 12. Thatmission includes five spacewalks aimed at extending Hubble?s lifetime throughat least 2013.